I’m far too tired to think of something cute for this most recent post, so I’ll allow you readers to get creative with it and make up your own, on your own. Sorry! This week/end was very packed with excursions, outings and travellings all over the South of France – sounds tough, right? We arose at a whopping 9am to take a We-Are-American-Tourists-Bus to a couple of stops including, le Louberon et la Rouge Terre. 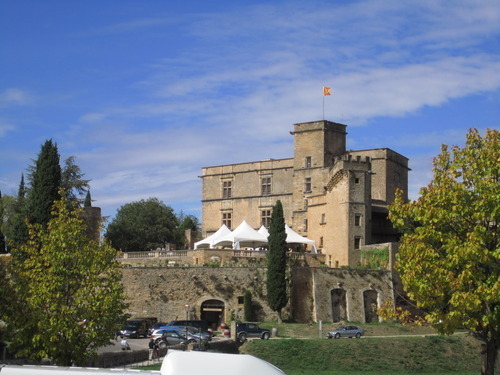 In the Luberon, I found my perfect chateau (castle) if I decide to have a destination wedding – future husband, start paying attention now. The gorgeous castle was closed to us on Saturday because of a police gathering, but that didn’t stop us from exploring the rest of the town. We tried wonderful pastries tht are specialties of the region – we’re very avid market researchers and thus made sure to try, not just the specialty cookie, but a chocolate croissant, too. We take this seriously. AUCP Marseilles & Provence in la Luberon (and in front of my future place of marriage, bien sur). After the Luberon, we made our way to a couple of other stops, including an adorably old town (not too hard to find) in the moutains where we had a great picnic and then continued on our sortie (outing) to a town where the ground is made of red clay! It was really like an Arizona meets South of France experience and tres cool. On Sunday, a few of us made our way to the beach. Long story short, we missed our intended bus and ended up deciding spur of the moment to head to Marseilles even though, according to our host families, the beach “n’est pas jolie.” Not too sure what kind of beaches our host families are used to, but I travel for a longer time to hit up Jones or Rye for the day. For 30 minutes and under 12Euros of travel cash, this seems pretty perfect et jolie to me! We even managed (quelle surprise) to make a few new friends (that we’ll obviously never see again). Needless to say, returning back to school on Monday was a bit difficult. But, I did come away from the weekend with, not only a greater appreciation for the region of Provence, but also a list of dates and places for where I want to travel for the rest of the semester. SO for any and all of you who are abroad, or who have the extra cash laying around to escape for any amount of time, check out this list and then contact me (Facebook, Skype, AIM, etc) and we can rendez-vous! Sept 24-27 (this weekend): OKTOBERFEST. 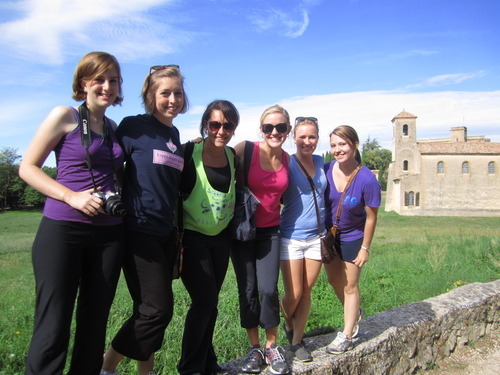 Oct 8-10: Local touring – maybe Toulouse/Avignon on Sunday? Dec 18—-> My program ends here but I’ll be around for about a week. Anyone who wants to stay in Europe and travel around, let me know! I’m open for most anywhere. Happy days to all. It’s just around lunch time for me right now so I’m going to go do something very French and grab some sushi with another fellow American. *Sigh* You can take the girl out of the states but she’s still gonna crave sushi. Isn’t that how the saying goes?